Important: Any prediction or analysis of a birth chart depends upon the accuracy of horoscope and birth details. In this case, the birth details of Aishwarya Roy, has been picked from a very popular Astrology related magazine, Future Samachar, issue January 2007 and page No.12. Details of birth as given in the magazine are as under: Lagna Lord : Saturn, Janam Nakshatra : Poorva Phalguni, Yogi Planet : Rahu, Duplicate Yogi : Venus, Avayogi:Venus, Dagdha Rasis: Aries, Leo. Atmakarka : Moon, Karakamsha Lagna : Scorpio, Arudha Lagna:Scorpio, Upp Pada: Aquarius. Current Maha Dasa : Rahu, Antar Dasa : Saturn Since this review is related to marriage and married life hence I shall deal all the aspects related to subject matter. However, an attempt is made regarding the prospects of progeny since this thing is directly related to survival of marriage. 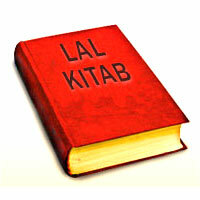 Since lagna is most important part of any horoscope, hence it is most important to say few words about lagna. Sign Capricorn rises in lagna at 4deg. 47minutes in the star Uttraphalguni, ruled by the Sun. This Sun is placed in the 10th house where it has got directional strength. But the good qualities of being LNL and by being placed in the 10th house has been spoiled due to its being in sign of debilitation and it suffers affliction since it is placed in Rahu’s star Swati. Lagna lord Saturn is placed in 6th house. Placement of Saturn in 6th house is appreciated but being lagna lord in 6th house it will render the lagna weak. Lagna it self is occupied by functional malefic Jupiter since it has lordship over 3rd and 12th houses. For marriage purposes houses 2nd representing kutumbhsthan, 4th representing sukhsthan, 7th is natural house of marriage and most important of all the other houses, 8 representing manglyasthan in case of females and 12th representing comforts of bed or bed pleasures. I shall not be discussing all the houses as mentioned but focus will remain on 7th house which is all important house as far as marriage is concerned. First of all it should be ascertained that 7th house, its lord and significator of marriage should not suffer from afflictions. The said factors should not be under the affliction of malefic planets, should not be associated with malefic planets or should not be under the aspect of malefic planets. Secondly lord of 7th and significator should not be posited in any of trik bhava Viz.6th, 8th or 12th neither the lords of these trik bhavas should be placed in 7th house. In the present case lord of 7th, the Moon and significator Viz. Venus both are conjunct in 12th house, a trik bhava. Both of these planets conjunct with Rahu and aspected by Saturn and Ketu from 6th house, another trik bhava. Saturn by being lord of lagna looses a bit of its sting but its malefic qualities has enhanced by being in 6th house, by its association with Ketu and by being in star of Rahu. Venus suffers heavy affliction by its association with Rahu, by being in Star of Ketu and by being influenced by the aspect of Saturn and Ketu. The Moon though not in Ketu’s Star but it too suffers heavy afflictions alike Venus. Thus lord of 7 house the Moon and significator Venus both are heavily afflicted. Coming to 7th house it is under the aspect of Jupiter, lord of 3rd and 6th, and a very powerful Mars from 4th house. Jupiter has turned out to be malefic and Mars is a Badhaka planet for this lagan, hence this aspect of Mars and Jupiter has spoiled the 7th house. Our sage with their insight and sacred vision has laid down some rules which cause problems in getting married or these are sufficient to spoil the married life. There are innumerable rules which can cause havoc to marriage or married life but I shall restrict to the rules applicable here. Rule No.1: Whenever lords of 11th and 12th houses collectively occupy or aspect the 7th house the marriage is denied but in case one gets married this marriage is short lived. In this case lord of 11th is Mars and 12th is Jupiter and both these planets are aspecting the 7th house. Rule No.2: Whenever Mars, Saturn and Rahu/Ketu influence the 6th, 7th and 8th house, in any sequence, by placement or aspect again marriage is short lived. In present case 6th house is occupied by Saturn and Ketu, 7th is aspected by Mars and 8th is aspected by Rahu and Saturn. Rahu aspects 6th house also. Rule applies. Rule No.3: Whenever in female horoscope the Moon, Venus or Lagan(any one of these) is in Rahu/Ketu axis it is detrimental for a happy married life. In present case the Moon and Venus both are placed at Rahu/Ketu axis. Rule No 4: Whenever lord of 7th house happens to occupy a trik bhava and it is further under the influence of malefic planet/planets marriage is short lived. In this case, the Moon is 7th lord occupying 12th house, a trik bhava, and it is associated with Rahu and aspected by Saturn and Ketu. Rule No.5: Whenever the Sun, the Moon, Venus and 5th lord or 5th house are under the influence of Saturn, by conjunction, by association or by being in star of Saturn, the marriage is denied but in case any one of above said factor escapes one may get married but that marriage is short lived. In the present case barring the Sun all other factors are being influenced by Saturn. Rule No.6: In case of females whenever the 8th house and its lord suffers at the hands of malefic planets it is highly detrimental for a long lived marriage. In this case 8th house suffers by the aspect of Saturn and Rahu while lord of 8th , the Sun, suffers by the aspect of badhka planet Mars and ketu. It is further afflicted by being in star of Rahu. Rule No.7: Whenever Venus is beyond 43deg. 20 minutes away from the Sun(either side) marriage is either denied or short lived. In this case Venus is more than 46degrees away from the Sun. Rule No.8: Whenever lord of 9th ,a bhagysthan, goes to 11th house which happens to be a badhksthan and is aspected by malefic planet/planets only marriage never survives. In this case lord of 9th is Mercury happens to occupy 11th house, a badhkasthan, and it is further under the aspect of Mars, the badhka lord, and a most malefic planet hence the rule applies. Rule No.9: Whenever the lord of 7th house of natal chart goes to a debilitated Navamasha and is influenced by malefic planet/planets it is highly detrimental for a happy married life and marriage seldom survives. In this case the Moon is 7th lord and is occupying sign Scorpio in Navamsha chart, which is a sign of debilitation of the Moon, it is in Rahu/Ketu axis and under the aspect of Mars. Jaimini Rule : Whenever upp pada Viz. Arudha of 12th house is in Rahu/Ketu axis or its 2nd and 8th houses are in Rahu/Ketu axis or these houses are influenced by malefic planets the Yoga is highly detrimental for a happy married life. 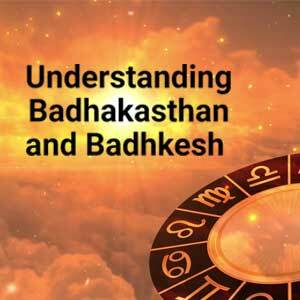 Neelkantta and Krishan Mishra, the renowned commentators on Jaimini astrology emphasize that these influences should be studied from Atmakarka, Arudha Lagan and Karkamsha lagan also since these influences are equally detrimental from these lagans as they are from Upp Pada. In the present case Upp Padda is Aquarius. This Upp Pada and its 7th houses are under the aspect of debilitated and afflicted the Sun and Mars(Jaimini Aspects). Atmakarka is the Moon and the Moon is in Rahu/Ketu axis in natal chart, Arudha Lagan is Scorpio its 2nd and 8th houses are in Rahu/Ketu axis while these are aspected by another malefic Viz. Saturn. Karakamsha Lagan is Scorpio, it is in Rahu/Ketu axis and the 7th house is tenanted by Mars along with Rahu. Hence Jaimini’s rule is also applicable. Conclusion : As per the planetary position as discussed above the picture is not rosy at all as far as married life is concerned. All the marriage related houses suffer heavily and so are the planet related to marriage. Neither the houses nor the planets related to marriage get any positive power from benefic conjunction or aspect. Native is under the major period of Rahu. Rahu, apart from other planets, is a natural significator (karka) of marriage. In the present case Rahu is a Yogi planet. 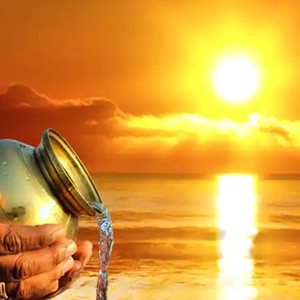 Yogi planets is considered very auspicious when occupies auspicious houses of horoscope but an ill placed Yogi planet is capable of giving good result. Progeny : Point related to progeny requires to be dealt along with marriage. Every thing related to progeny should be studied from 8th house, 8th lord and significator (Karaka) Viz. Jupiter. While dealing with these factors one should see the strength of 5th house, 5th lord and Jupiter. Due attention should be paid to good or bad yogas around 5th house, 5th lord and Jupiter. In present chart 5th house contains sign Taurus and lord of 5th Viz. Venus is posited in 12th house under heavy affliction from Rahu, Ketu and Saturn. 5th house is hemmed between malefic planets Viz. Mars in 4th house while Saturn and Ketu in 6th house. Significator (Karaka) Jupiter though aspects the 5th house but it is him self “ debilitated. Thus all the three factors Viz. 5th house, 5th lord and Jupiter suffer badly. Placement of 5th lord Venus In 8 house from 5 house is also bad. Apart from 5th house one should give due attention to 8th house from ascendant since it is 4th house from 5th and indicates happiness one will get on account of children. Here 8th house is under the aspect of Saturn, Rahu and Ketu thus badly afflicted while 8th lord the Sun suffers at the hands of Mars and Ketu by aspect and by being in star of Rahu. Next comes 10th house from ascendant since it is 6th house from 5th house and tells about the well being of children. As stated earlier the 10th house as well as its lord Viz .all are heavily afflicted. Lastly the 12th house from ascendant since it is 8th house from 5th thus indicates the longevity of a children. 12th house is under heavy affliction while lord of 12th Jupiter is debilitated hence 12th house and its lord also suffer very badly. Hence all the factors related to progeny suffer from one or other affliction. Our sages has evolved a method of which tells about the fertility of a woman and this is known as “Kshetra Sphuta”. The word “Sphuta” means longitude. This ‘Kshetra Sphuta” is arrived at by addition of longitudes of the Moon, Mars and Jupiter and the final longitude obtained is known as “Kshtera Sphuta”. In case this “Kshetra Sphuta” falls in an odd sign in natal chart as well as navamsha chart progeny is denied. Affliction to this “Kshetra Sphuta” adds fuel to fire. In this horoscope “Kshetra Sphuta” falls in sign Libra in natal chart and sign Sagittarius in navamsha chart thus on both counts it is in odd .) signs. In natal chart it is heavily afflicted while in navamsha chart it is hemmed between Saturn and Ketu and it is being aspected by Mars. Though the lord of Sagittarius Viz. Jupiter also aspects ‘Kshetra Sphuta” in navamsha chart but this aspect is not sufficient to counteract the negative forces. NOTE: Validity of this study stands accurate on the face of correctness of the horoscope. The source of birth details have already been mentioned. 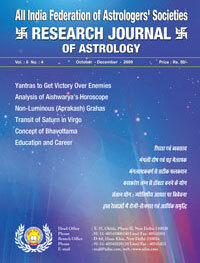 In this Horary Astrology, Raj Yogas and Education Issue of Research Journal of astrology there are various informative and research oriented articles like - Anaysis of various question charts, Rajyogas of Primeministers of India, Prediction from Buddhashtakvarga, Astrology and Cancer, Mangal Dosh and Horoscope Matching, Education and Profession, Yantras to Get Victory over Enemies, Analysis of Aishwarya's Horoscope, Transit of Saturn in Virgo, Concept of Bhavottama etc.